akai: gnarl» Blog Archive » Problem solving: How to speed up the implementation of IPv6 at Internet service providers? akai on Re: Who governs the Internet? Dapwip on Who governs the Internet? Emerging Internet Security Threats: Spring 2009 | Computer Security on Who governs the Internet? akai on Problem solving: How to speed up the implementation of IPv6 at Internet service providers? Problem solving: How to speed up the implementation of IPv6 at Internet service providers? In march 2001 I was introduced to IPv6. IPv6 will coexist with, and eventually replace IPv4 when the pool of available IPv4-addresses run out. Currently the estimates says that there will be no more IPv4-blocks available by 2012 for Europe and North America. This will probably all linger on, since there exist some methods to distribute addresses in private networks with NAT and I also believe the regional Internet registries (RIR) will do some kind of coordinated “official thing” when things get “bad enough” in the Internet-based services-sector. Up until today the uptake of IPv6-based networks and services have been very slow. Here in Norway it’s really just UNINETT and the members of the national science network that have good access to native IPv6-based services and networks without the use of IPv6-via-IPv4 tunnels and such. As some of you who read my weblog from time to time might know, I work for a small Norwegian Internet Services-provider, ITsjefen, who have six employees. We’ve tasked (thanks Dilbert) ourself with the task to deliver digitally good services in our own fibre- and ethernet-based network. As a part of this strategy we’re members of RIPE, and a local Internet registry (LIR) for ourself and our customers. Through the membership in RIPE I’ve had the pleasure of formalizing my knowledge of alot of subjects, and among them, IPv6. I’ve come to the conclusion that we need to speed up the uptake of IPv6 among the large Internet Service Providers here in Norway before it’s too late. – To get Telenor, Ventelo(BaneTele), NExtGenTel, Get, Canal Digital and others, including service providers in the mobile Internet sector (Telenor Mobile, Network Norway, NetCom and Tele2) to plan the implementation, roll-out and marketing of IPv6 is a very heavy process. This will take time. Thus the task of getting these large players aboard is a thing for the powers of the free market, and it’s here I enter the picture again, with my funny little plan. – Why not begin with the smaller and medium companies and through them create enough push so that the large companies will get aboard and see the purpose of rolling out services before it’s just-too-late? Well. As planned, I embarked on this with my special idea to get this done. Five weeks ago, I was given a link to the picture submitted by American ISP Hurricane Electric (HE) with their cunning plan to solve the IPv6-disconnect in their peering with also American ISP Cogent Co. 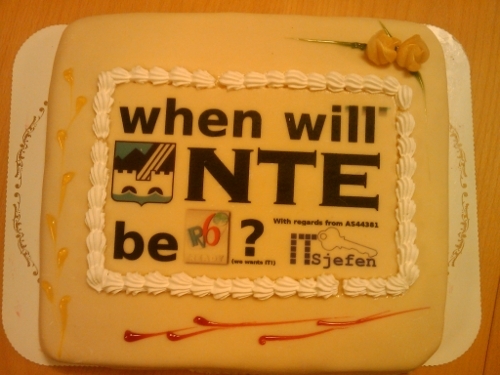 The technical guys at HE nailed it with baking a cake and bringing it to a NANOG-meeting (The North American Network Operators Group). The cake can be viewed here. So, what kind of conclusions can we bring to the first phase of my IPv6-by-cake uptake in the Internet Service Provider-sector of Norway? 1) It really helps to have your own IPv6-block available and ready for use when your upstreams are ready. Then you have reason to bug them for IPv6 already. 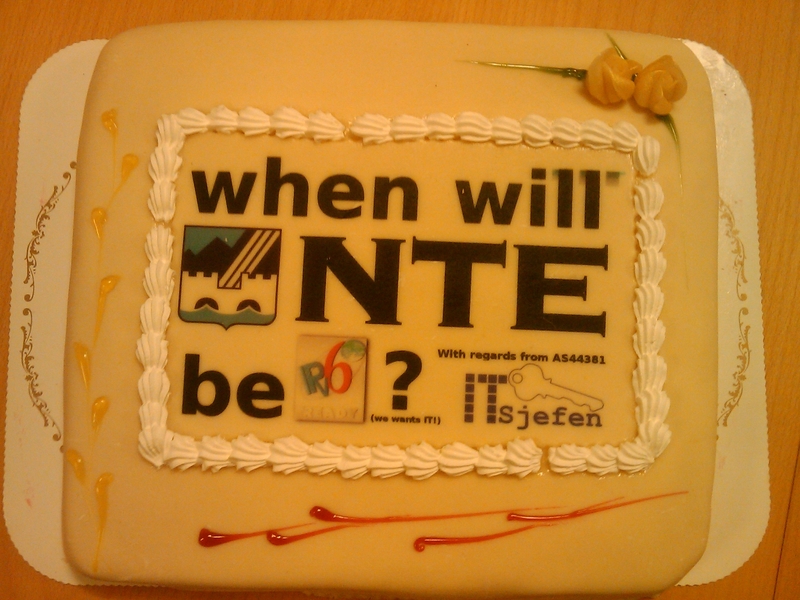 2) A cake helps even old engineers to get interested in new and shiny services in the form of one and zeroes. 3) It helps to have a good tone with your peers, the providers, partners and customers. New services should be fun and something you look forward to using. 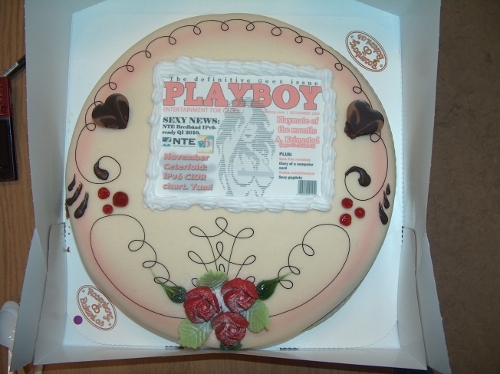 The question now is, should we send someone else a cake, and to whom? Thank you for all the nice (and those not to nice that I’ve marked private from you American tractor-loving farmgirls :-)) comments! I’ll take some time after new years to send out some of the cakes I’ve received ideas to distribute. Stay tuned for that!